Most state park systems have some kind of Campground Host program. This involves signing up (way in advance for those highly desirable S. Florida campgrounds during the winter months) to volunteer approximately 20 hours per week at the campground in exchange for a free camping site during that time. I haven’t looked into it too much at this point because we’re just not there yet, but if it is 20 hours per week per campsite, that’s only 10 hours per week apiece for couples. So, if the average campsite is $20 per night (most are more), then the net exchange rate is $7 per hour. But when you consider that you’re not having to pay any taxes on that amount, it raises the pay equivalent to about $10 per hour. Not bad for a part-time job that can be split between two people! The Florida state parks we’ve been to so far have 2-4 Host sites, usually right beside the bathroom/shower houses, where I presume a good deal of the volunteer work occurs. 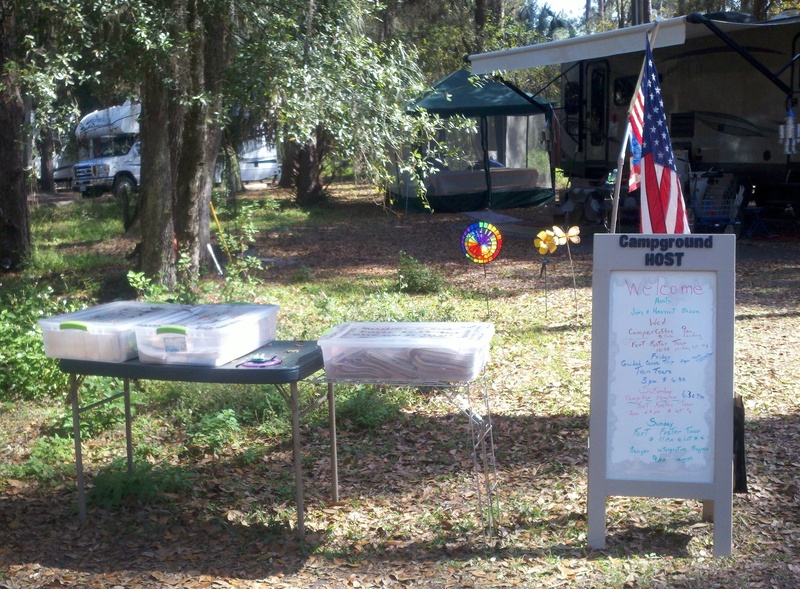 When we were at Hillsborough River State Park, our site was right across the lane from a particularly enthusiastic host couple, as evidenced by their very welcoming display, and the different activities available during the week. I didn’t have an chance to meet them, since we were there on a quick weekend run, but I did notice the big magnet on the side of their truck. 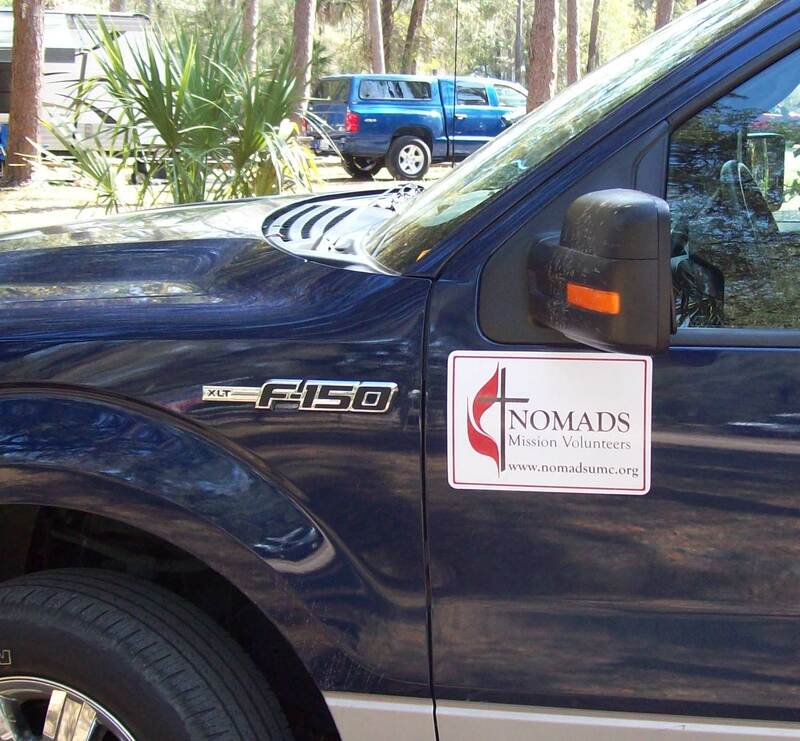 In addition to being Campground Hosts, they were also members of the United Methodist NOMADS, a mission volunteer program. While not listed on their official Camp Host white board, I’m thinking a regular Bible study was probably part of their contribution to the camp calendar, too. Putting “campground hosts” into a search engine yields many results for all different states, and CampHost.org has listings for several states. Again, not something we’re ready for just yet, but I can definitely see this program being part of our future plans. This entry was posted in Uncategorized and tagged Campground Host, volunteer. Bookmark the permalink.